Prosecco Conegliano Valdobbiadene Superiore DOCG – Art, Food, Travel and Fashion! 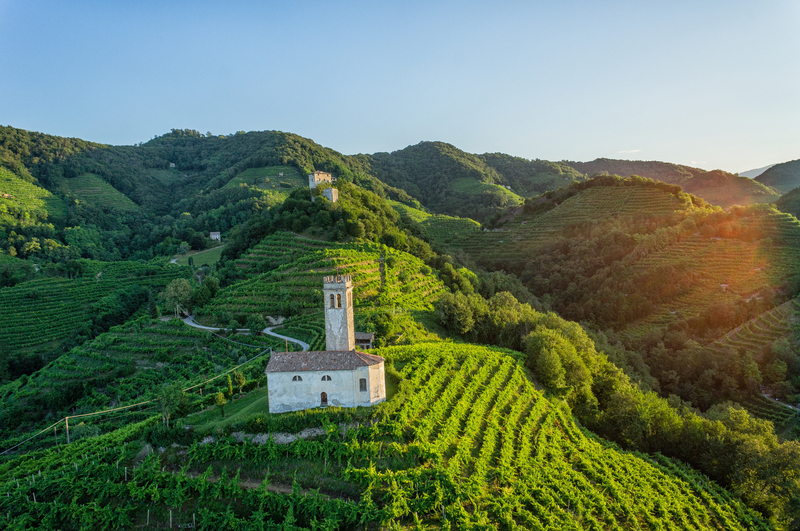 Conegliano Valdobbiadene is a small zone in the Veneto nestling between the world-famous splendour of Venice and the austere beauty of the Dolomites. Here, in the Province of Treviso, in the hills that stretch northwest from Conegliano towards Valdobbiadene, man has cultivated for centuries not only the Glera grape variety, but also the culture of winemaking. In Fact, Italy’s first School of Winemaking, the “Istituto Cerletti”, opened up in Conegliano in 1876; in 1923 the Institute for Viticultural and Oenological Experimentation was founded, also in Conegliano, nad even today the University of Padua has an annexe of its Oenology Faculty there. It is this zone that produces Conegliano Vadobbiadene Prosecco Superiore D.O.C.G., a wine that – still today – can only come from 15 communes: Conegliano, San Vendermiano, Colle Umberto, Vittorio Veneto, Tarzo, Cison di Valmarino, San Pietro die Feletto, Refrontolo, Susegana, Pieve di Soligo, Farra di Soligo, Follina, Miane, Vidor and Valdobbiadene. Conegliano Valdobbiadene is the dynamic heartland of a much larger area that represents the entire world of Presecco, a varied panorama of natural enviroments and flavours that includes several Denominations: Conegliano Valdobbiadene Prosecco Superiore D.O.C.G., Asolo Prosecco Superiore D.O.C.G. and Prosecco D.O.C.. Alle three Denominations correspond to areas that are very different in terms of size and landscape.